Mobility as a Service has become a reality, as more organizations rely on service providers to manage their mobility, that is now a core requirement. 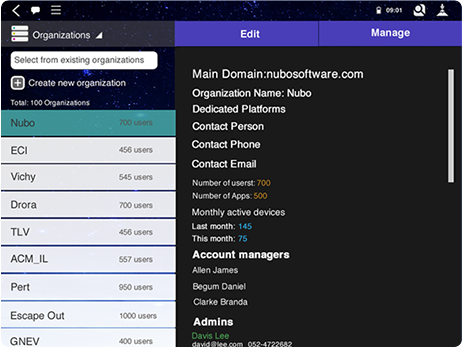 In addition, Service providers are in need,now more than ever, of offering mobile apps or entire mobile solutions, as part of their main service proposition With Nubo, mobility is offered as a full SaaS solution. Full SaaS running apps, storage and management in the cloud. “All in One” solution with pre-packaged apps. Zero device management. Fast and simple Mobile Application Management capabilities. High-Security Mobility – zero data on devices, flat protocol. Supports both managed and un-managed devices. Reduce service cost vs. traditional mobility solutions. Can be installed as private cloud on the service provider’s premise. Multi organizational management console for admins and account managers. Branding / Integration / Bundle options for service providers.